paperimajuri: Woyww #322 -it's Wednesday again! Where do these weeks fly? Schools begin in Finland next week, and I just received my teaching schedule beginning next Tuesday... it's hanging on the right, on the screen of our old computer. My desk shows a neat mess of stuff that's left behind after finishing a project: stamps and stencils and Crackle Accents. 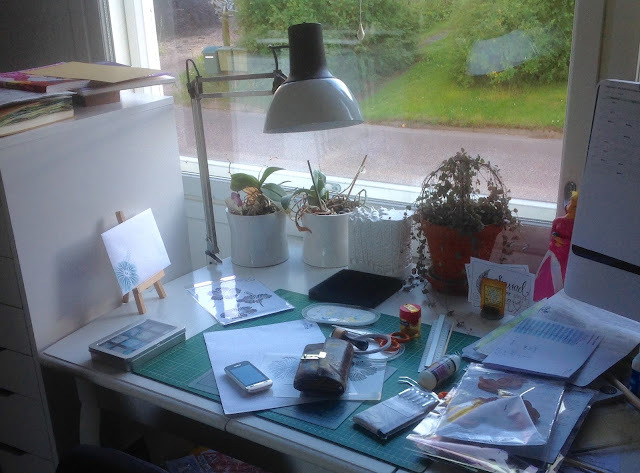 Most of today's visitors know what this is about, but if you don't, pop over to the Stamping-Ground blog to find a lovely international desk-hop of crafty work spaces. To finish a hibiscus card project I made some simple mail art on the envelope, visible on the left against the white drawer unit. On top of the drawers is a kraft card base waiting to turn into a bendy card (got to check the tutorial on Angela's blog once more), my art journal and a "how to draw manga" book. The DLP prompts are asking for drawings of faces this week (all month...) and I went to ask my girls if their manga books had some eye practices. There were several, and this one felt least comic-like. I'm still not sure how to dare myself to try! My purse is out, because I had to change my credit card info at PayPal... my bank called me a few weeks ago after someone in Africa had tried buying train tickets with my credit card. Took two weeks to get a new one. I'm feeling lucky I just had to suffer the inconvenience. Hi Kristiina, it does seem the school holidays went by quickly this year, and I don't have any school age kids, only grandchildren. Hello Kristiina, pleased to meet you (don't think I have visited your blog before). I like the hibiscus mail-art - really lovely. I'd be delighted to receive a card in such a pretty envelope. Our school break starts and ends later than yours, as England is further south. I know that when we stayed with my in-laws in Norway, the schools were back in August - we were surprised at how cheap our accommodation was, but it was because it was term-time there! I hope your new term goes well.